An untouched reproduction of a classic mid-century design. This authentic design reflects all of the original features of it’s mid-century counterpart. 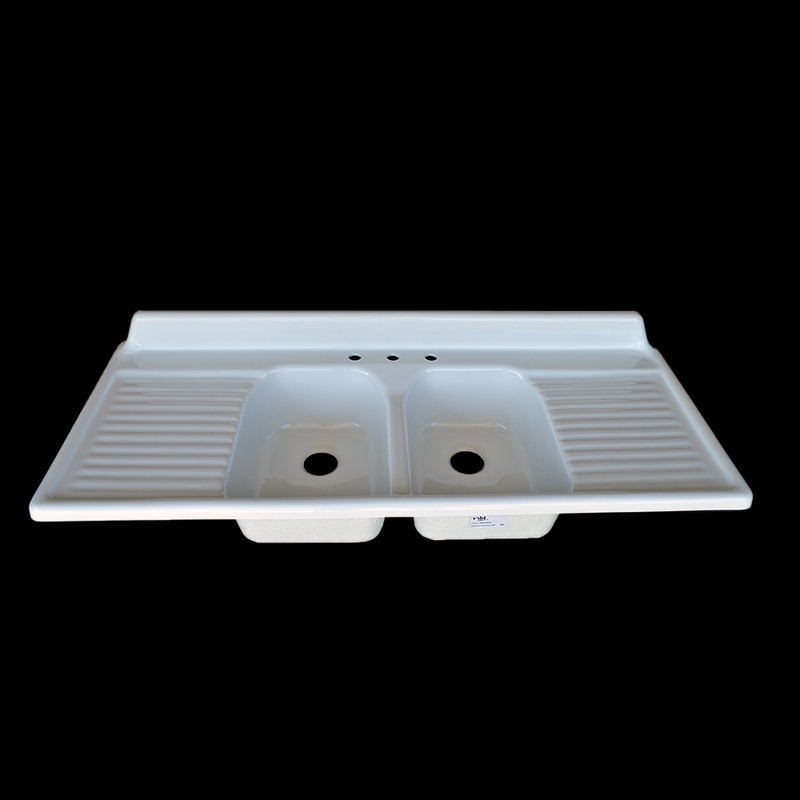 This model offers dual basins that are flanked spaciously by twin fluted drainboards and a beautiful integrated mitered back-splash. The overall combined basin dimensions allow this model to fit easily into smaller modular sink base cabinets without modifications. Both drain holes are drilled to a standard 3.5″ diameter and are waste disposal system compatible. 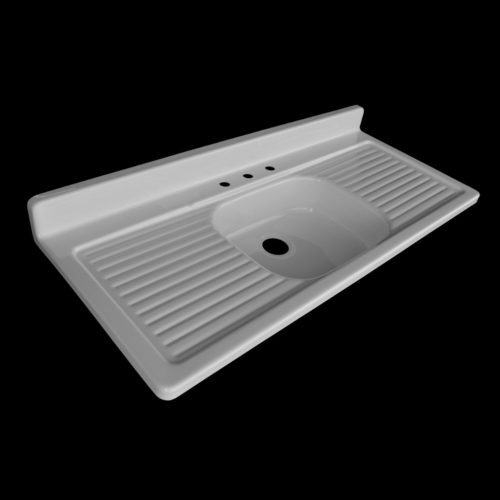 Manufactured in-house from durable reinforced cast acrylic, this reproduction achieves excellent durability and ease of care while maintaining an authentic vintage style. Quality assured by our five year manufacturers warranty and your satisfaction guaranteed or your money back per our 30 day return policy. 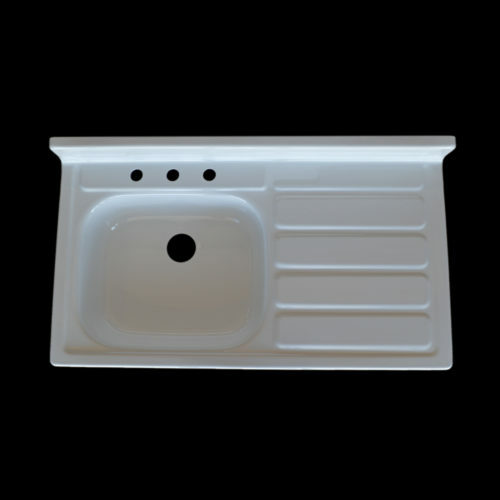 Overall dimensions: 60″ length (side to side) X 24.5″ width (front to back) x 5.5″ H (from bottom of flange to the top of backsplash,12.75″ when including sink basins. 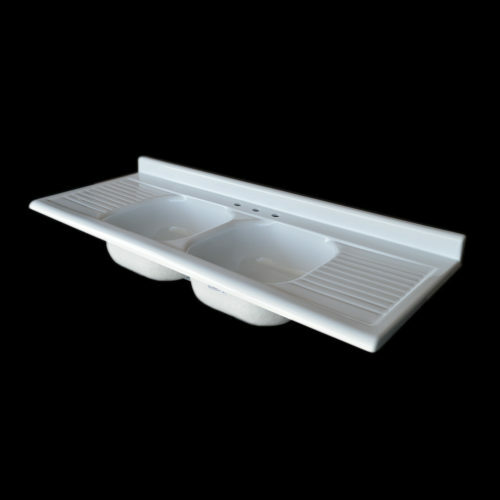 Each basin measures 13.5″ long (side to side) X 18″ wide (front to back) X 7.25″ deep. 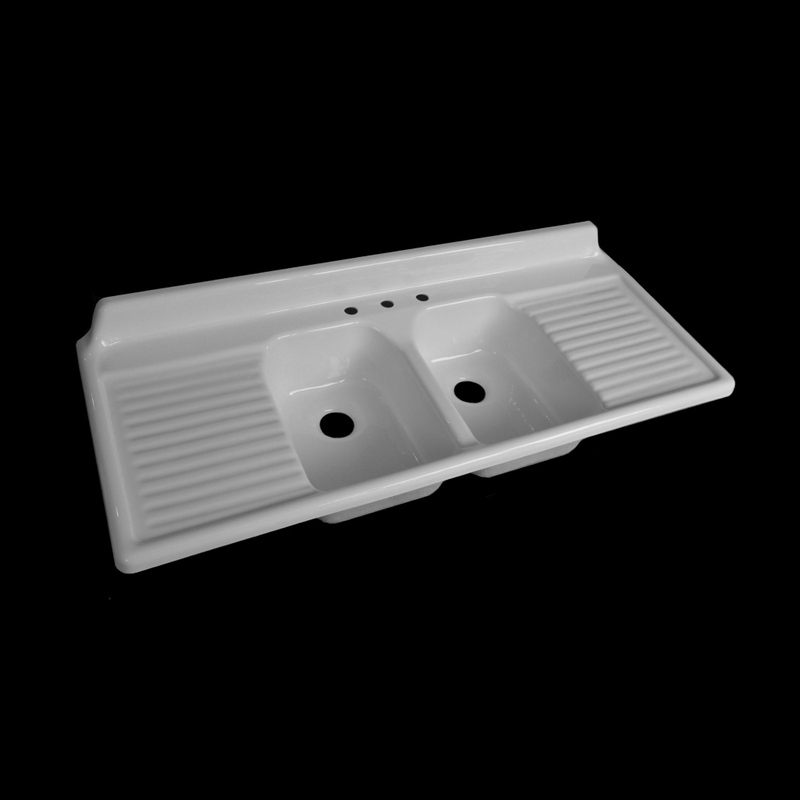 Combined exterior basin width is approximately 29.5″ L (side to side) X 18.5″ W (front to back). Excellent product but the sink leaves two small pools of water in it that don’t drain. The water just sits there until it evaporates. Beautiful sink and the customer service was excellent! This is one of my all time favorite purchases. Love this sink!! 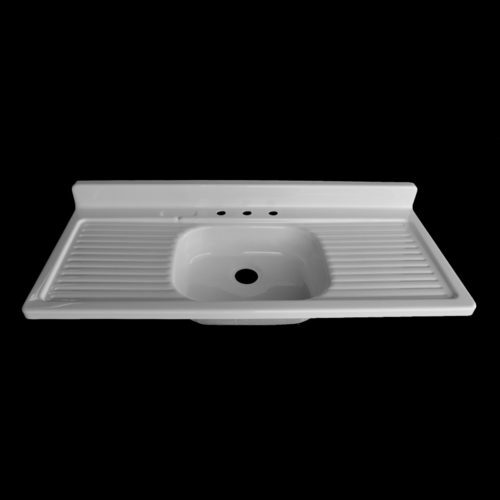 The only thing didn’t know before ordering was that it would not fit over lip of sink cabinet so had to use extra piece on cabinet before setting sink but was not a major problem merely purchased top for cabinet then set sink. Cleans so easily with just water and dishcloth Replaced old cast iron sink with this and it looks just like the ones we had in the fifties which is the look I was looking for. Just finished our kitchen remodel on our log home. Sink was easy to install and looks great! Easy to clean. I did place mats in the bottom of each basin due to the rough nature of others in the home. My husband & I renovated our 80+ year old farmhouse kitchen around our NBI double drainboard sink and we couldn’t be happier with the way it turned out. He made a couple of calls to customer service and they were excellent in walking him through the ‘how-to’s’ of installing it. Thank-you NBI!! I haven’t installed the sink yet. Upon receipt, I thoroughly inspected it and am quite pleased with the construction and finish. I also have to give kudos to the person that designed the packaging for your products. It is obviously well thought out to provide maximum protection of your products during transit. We are building a new home after living in our 1950’s bungalow for 25 years. The best part of my little bungalow was it’s original drain board sink. 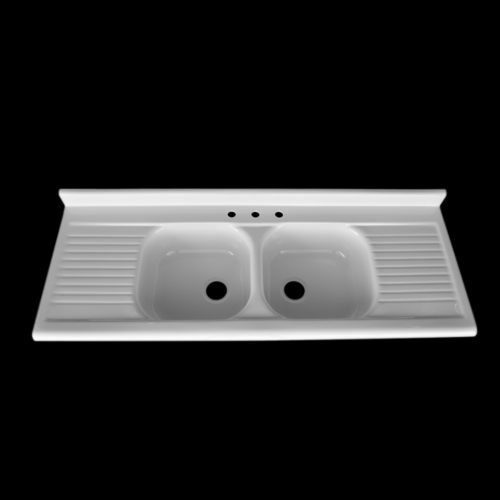 It wasn’t just the uniqueness of it, but it is functionally the best sink ever. I wanted that in our new home and was thrilled to find it here. It is perfect. This is the best part of our new kitchen. Love this sink! It arrived on time as promised, was packed securely and was exactly what we were looking for. Wish there was a place to put in a picture – looks even better when set in place. Easy to install. OUTSTANDING! BEST purchase of our kitchen remodel! It arrived quickly and was easy to get into the house. This sink is the one item we purchased that is worth EVERY penny! The surface is smooth and so far very durable, our hard water hasn’t been a problem. 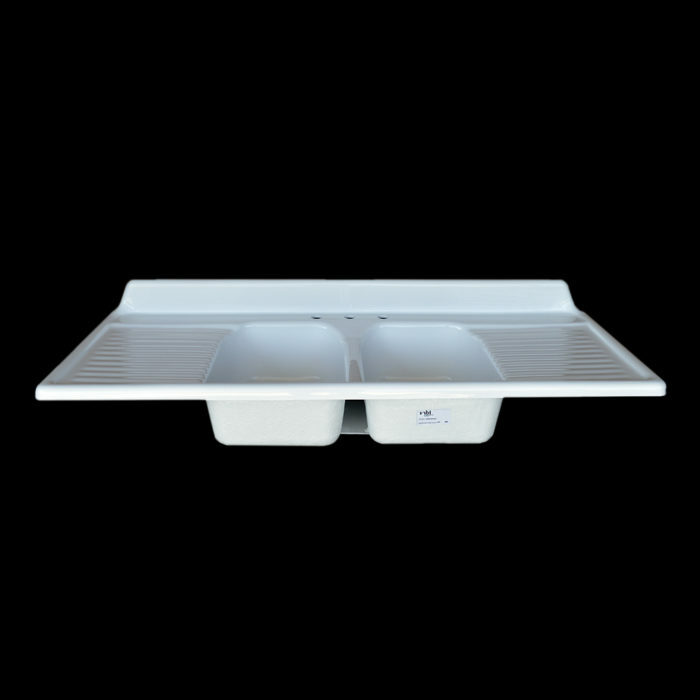 The drainboards function perfectly (No more dirty dripping rags on the counter or ugly drain bins!) The back splash is a major bonus. Installation, and instructions were clear and went smoothly, though we have yet to caulk it. Apparently we haven’t needed it yet. 🙂 We rarely review an item but couldn’t wait to review this one! We installed butcher block counters knowing the risks. So far this lovely sink (which has not even been fully caulked to the counter) has prevented any water on the counter. We installed an old style three arm rag/dishcloth rack above one drainboard and the whole system has been wonderful. 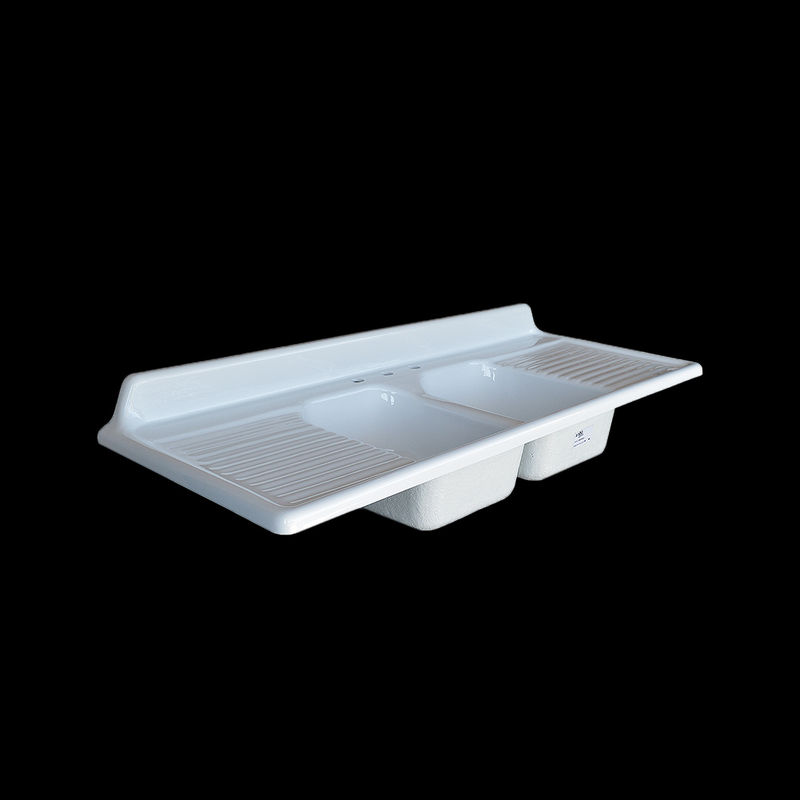 We wanted an original drainboard sink, but with the complications involved in restoring and plumbing this was the better solution. Now that we have lived using it over a month, we think it is better than the originals in depth, beauty and durability. The sink was the second most expensive item we purchased (second to cupboards) and we are thrilled! We felt it was risky as we had never seen NBI’s product in person. 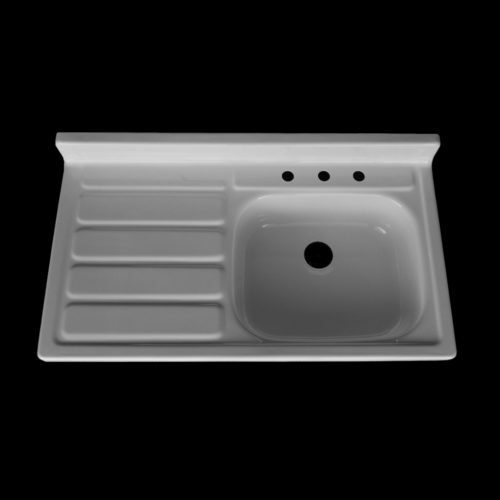 We worried the sink would be too shallow, however, to our happy surprise it is not, in fact the sink depth and width has been utterly perfect. 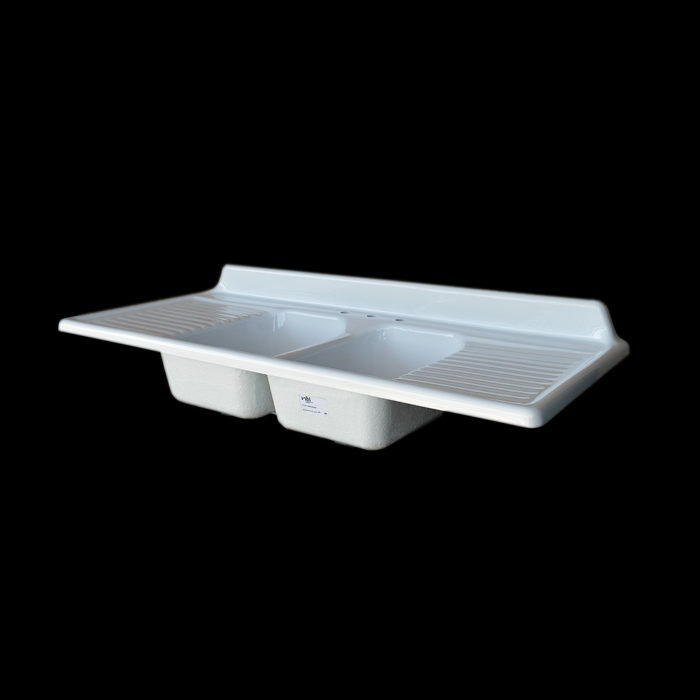 We regularly use large heavy soup pots, large baking sheets and glass pans, all are easy to wash and dry in the space. Thank you for a wonderful, beautiful sink! We wonder why this style ever went out of mass production as it is so incredibly functional and beautiful. Friends and family all ask where we got it, how much was it and the first thing we say before they cringe at the price is….its worth EVERY PENNY and here is why… Thank you again! I’m sorry I forgot to mention in my review: Having the option to have an extra hole in the sink was fabulous! Now we have a reverse osmosis system on tap and that is VERY luxurious. We appreciated the option VERY much! Thank you again! I waited a few months before writing my review because I actually wanted to use it for awhile before forming an opinion. I really didn’t need to because the moment I opened the box I was ecstatic!! It is soooo beautiful and it has not disappointed me. Besides being the one thing everyone oohs and aaahs over it is so functional. We have butcher block counters and I was worried about water when I found the NBI sinks. Erased all my worries about the water issue. I was also a little worried about the depth of the sink but I can honestly say it has not been an issue for anyone in the house. I bought the double sink drain board. I’m probably a little more careful than anyone else in the house but we’ve had no issues with scratches, drainage, or any other problems you might think about with a reproduction. My husband told me I didn’t have to tell him anymore that I loved my sink-he got the point! 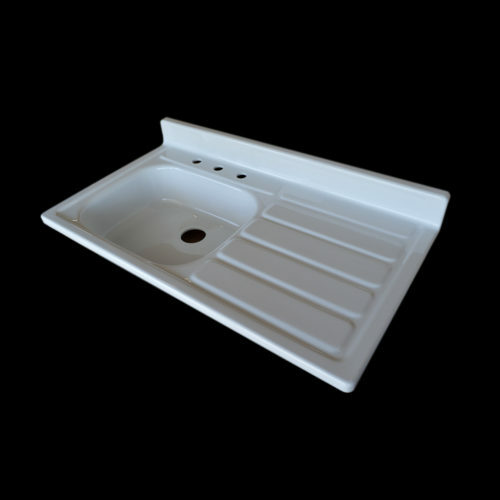 I will also say I had an issue when I first received my sink and if I could give Ken 10 stars for all his help I would! 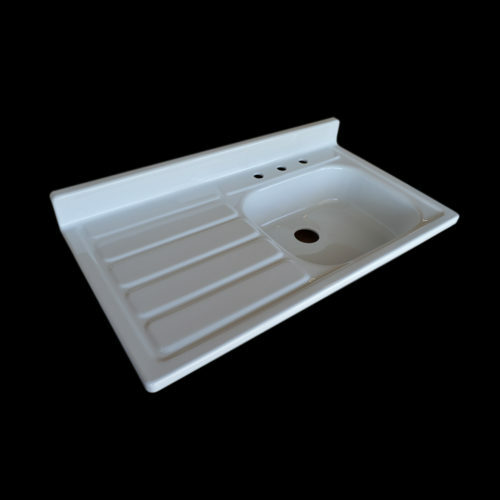 If you’re looking for a reproduction vintage sink……this is the place to buy it! !